The Toy Poodle is a smaller subset of the Poodle breed, and it certainly lives up to its Toy name. Standing only ten inches high and weighing approximately six to nine pounds, the Toy Poodle is the smallest of all the other kinds of Poodle, which also include the Miniature Poodle and the Standard Poodle. Poodles are the second-most intelligent dog breed in the world, ranking behind the Border Collie. Their intelligence makes them easy to train, flying through tricks and obedience training like an A student. They are perfect candidates for agility training, which will exercise both their mind and body. Other intelligence-heavy games these dogs would love include fetching named toys, hide and go seek, food puzzles designed for dogs or performing tricks to an audience. Their intelligence has served them well over the years as they were once both hunting and circus dogs. These dogs generally do well when meeting strangers or new animals, although some dogs may be shy. This shyness can be combated with continued positive exposure to new people and new environments paired with praise and treats when the dog reacts well. Toy Poodles are even-tempered, delightful dogs who enjoy the company of their owners and other people. This breed is also somewhat sensitive. They suffer from separation anxiety if left alone too often, and they are easily startled by a loud sound or unexpected touch, so do not be discouraged if your dog jumps, just be sure you give them fair warning next time and establish a line of communication with your dog. Toy poodles also learn routines well. They are soothed if their day follows their typical routine, but if their day deviates from the routine they may become anxious. Despite the name Toy, Toy Poodles are too delicate to serve as companions for children, who may play too roughly with them for both their size and temperament. 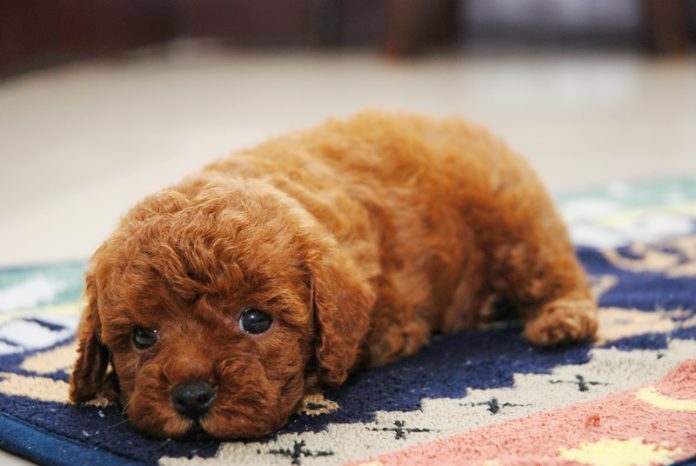 The coat of the Toy Poodle is a distinctive curly texture. Unlike most dogs, the Toy Poodle has a single coat, rather than a double coat. When the Toy Poodle sheds, stray hairs get caught in its curls instead of flying around the area. While this is good news for allergy sufferers, owners need to groom their Toy Poodles often and thoroughly to prevent mats from forming in their dog’s fur. Toy Poodles should be brushed every other day, and their fur should be professionally groomed and cut multiple times each year. Their feet, face, and rear end should be cut monthly so that your dog’s feet do not slip or its feces does not get caught in its fur. The rest of the fur on the body should be clipped four times every year. A prospective Toy Poodle owner should factor in this grooming necessity before bringing a Toy Poodle into their life. The Toy Poodle should not be kept outside, they should spend most of their day and night inside when not playing in a fenced-in yard or out for walks on a leash. This breed requires a few short walks each day, as well as play sessions that exercise both its mind and body. The average Toy Poodle lifespan is approximately 12 to 14 years with few health problems. However, some dogs may develop Addison’s disease, thyroid issues, epilepsy, hip dysplasia, and cancer. Also due to the possibility of tracheal collapse, harnesses rather than traditional collars or choke collars are suggested to be used for Toy Poodles. Additionally, due to its non-shedding coat, the coat can grow into the ears and cause infections and should be monitored. Source your Toy Poodle from a reputable breeder to minimize health and behavioral issues, or adopt one from a rescue so you know your dog’s adult personality. Wherever you acquire your Toy Poodle, this beautiful small dog is sure to live a long and happy time with you and your family.